Towards the end of his post (please see source link at the bottom) Jenkins relates a story of harvesting wheat under Jewish supervision. This poignant account illustrates the extreme carefulness of keeping the commandment of the feast of unleavened bread. This harvested wheat would be kept until the next year during the traditional barley harvest in Israel or about 10 months. Of course these Jews were not in Israel in the account but the timing is the same. The Feast of Unleavened Bread required the Jews to clean out all sourdough starter (yeast) that was used to make bread rise, hence, the fear of moisture which might ferment the grain with naturally occurring air-borne yeast . They were, as part of the Pesach (Passover) observance required to do three separate things: 1. Clean out the sourdough starter and eat unleavened bread for 7 days 2. Sacrifice the Passover lamb at twilight and eat it with staff in hand. 3. Wave the barley sheave that had just ripened in the Land of Israel. The first 2 Observances related to their flight from Egypt which they were to remember how God miraculously delivered them: their dough didn’t have time to rise and they fled in haste with their cloaks tucked in their belts and staffs in hand. This was the first redemptive month for Israel and its timing related to the barley harvest in Israel. Had they obeyed and entered the land at that time they could have enjoyed this harvest. Somehow I think these observant Jews in this account missed the redemptive meaning and bigger picture of God’s deliverance. When John the Baptist first encountered Jesus: “Behold the Lamb of God which takes away the sin of the world.” Jesus has become our Passover (1Cor. 5.7) the firstfruits to rise from the dead (1Cor. 15.20). If we can’t trust God about Genesis 1, how can we trust him about John 3:16? A moment’s googling shows that this question (or some version of it) is used by Answers in Genesis, the young-earth creationist organization, and specifically by Ken Ham of that organization. The concept was not new to me, but that wording was something I hadn’t heard before. To lay my cards on the table, I’m pretty sure the earth and the cosmos are very old. I would call myself an old-earth progressive creationist–a category not very well-known in YEC camps, where everyone who is not young-earth is generally thought of as an evolutionist. Actually, as readers of this blog know, I’m an outspoken advocate of intelligent design theory, and I’m also quite willing to come out and say (more so than some authors in the ID camp) that I think this evidence supports repeated intelligent interventions in the making of various species and animals, not merely in the origin of life or some other major transition. I don’t have enough expertise to state precisely how often God probably created new species, but I’d be willing to lay bets that mammals didn’t evolve by purely natural processes from reptiles, for example. I’m also an extremely strong supporter of the historical Adam, though I think he lived a lot longer ago than 6,000 years. (And no, I don’t know exactly how long ago. And that’s actually okay.) By “the historical Adam” I mean a real man, the one and only male progenitor of the human race, from whom, with Eve his wife, all of us are biologically descended, without interbreeding with non-human animals. I think that God made him by miraculous means and that there was strong physical as well as spiritual and mental discontinuity with all animal species. I’ve argued for the theological and even ethical importance of this view,here. I’ve also strongly opposed the recent work of John H. Walton in proposing a radically different view which he calls “an historical Adam” but which is not “the historical Adam” in the strong sense I have just defined. See my posts contra Walton here, here, here, and here. And I’ve argued that the scientific claims that it is impossible for one couple to be the progenitors of the whole human race are shaky, here. So I don’t at all shrink from the creationist label, and I’ll admit to being more than a little impatient with John H. Walton, and even more so with Peter Enns, whom I find annoying. All of that, I admit, may not be enough to establish my creationist “creds” with a real hard-liner on the age of the earth, but I’d like to think it would be a start. With all that out of the way, let me go back to the saying at the beginning of this post and say this: It’s wrong. Why is it wrong? After all, on its face it almost sounds like a tautology. Either we do or don’t worship a deity who is, by his very nature, not a deceiver. If we do, then we can trust him about everything, right? Including various parts of the Bible. And if we worship a being who might deceive us, then how can we trust him about anything? But the saying is still wrong. It’s wrong, to begin with, because it confuses God with man. What Ham is doing there is identifying his interpretation of Genesis 1 with “God’s word” and insisting that, if Ken Ham is not infallible in his interpretation of Genesis 1, then God is a liar. Mind you, I can well imagine that Ken Ham and I would have a lot more in common than I would have with his critics. To me, the comments by the Gungors (some musicians), to whom Ham is responding in that particular blog post, sound over-wrought and snobbish. They give the distinct impression that anyone who isn’t an evolutionist is a contemptible knuckle-dragger. I have no patience with that kind of thing. But the fact remains that it is a perilous and a misguided matter to identify your interpretation of one passage of Scripture with what God says, with no questions or differences of opinion allowed. All the more so when the question at issue is one where scientific evidence also comes into play. We absolutely must be willing to admit to our young people that there is such a thing as biblicalinterpretation, that controversy about biblical interpretation isn’t per se a bad thing, that human interpretations are fallible, and that our interpretation of Genesis 1 is notequivalent to “God’s word.” Yes, that means admitting that you could be wrong about it. I think you should be willing to tell kids that this is what you think, but that you could be wrong. You can even be a young-earth creationist and tell them that. This issue of varying interpretation comes up in many places in Scripture. You aren’t turning into a Christianity-denying liberal if you think the story of the rich man and Lazarus was a parable that Jesus was telling and that Jesus wasn’t actually affirming that it happened. Jesus often told parables. This looks like one of them. Another example: It is a completely viable possibility that the flames of hell in various biblical passages are a metaphor for the horror of eternal separation from God rather than describing a physical state of the damned. There can be legitimatedifference of opinion on that point among those who take the Bible very seriously indeed as God’s Word. There are also textual areas where we as Christians need to be able to keep our heads and handle some uncertainty. It is not an abandonment of the Bible to recognize that the long ending of Mark may not have been there in the original text that Mark wrote; in fact, there is solid textual reason to doubt that it was. There is even reason to believe that the original ending of the Gospel of Mark may have been lost.That’s okay. That’s not true. Nowhere in the Bible does anyone say to anyone else, “Believe that the earth is 4,000 years old [or whatever it would have been at the time], and thou shalt be saved.” But people are told to believe on the Lord Jesus Christ for salvation. When the Apostle Paul gives a creed in I Corinthians 15, he doesn’t include anything about the age of the earth, but he does talk a lot about the resurrection of Jesus Christ. When Jesus is asked what the most important commandments are, he lists loving the Lord God with all your heart and soul. I don’t want to be misunderstood. This isn’t meant to encourage a facile argument of the sort one hears from social liberals nowadays, “Jesus never condemned homosexuality, so why are you Christians getting so het up about it?” Jesus explicitly taught that God made male and female and created marriage between them. The Apostle Paul again and again condemns homosexual practice. And then there is the natural law, which is another topic altogether. My point is that biblical authorities do have priorities, and there is not the slightest indication whatsoever that the age of the earth is one of the high priorities. The existence of Adam, I’ll grant, is given prominence in several important Biblical teachings, such as Paul’s teaching about the origin of sin and death. But not the age of the earth, nor the creation within six twenty-four hour days. Another, related problem with the statement is this: It teaches that all literal biblical interpretations stand or fall together. It strongly implies that, if the most natural, literal, on-the-face-of-it interpretation of Genesis 1 is called into question, it becomes impossible to know what any other part of the Bible means. But that’s not true. I might be wrong about whether the days in Genesis 1 are ages or 24-hour days, but I can say with much greater confidence that the Gospels are asserting that Jesus really lived, really walked on this earth, really said various things, really died on the cross, and really rose again. The genre of the gospels is different. The sources of information are different. The nature of the claims is more tied into known history. (He was crucified under Pontius Pilate, etc.) We should not think or teach that a wide-ranging skepticism about all Biblical meaning is the only alternative to a 24-hour-day interpretation of Genesis 1. That’s incorrect. And finally, perhaps my most controversial claim: That slogan communicates to young people that, if they are not young-earth creationists, they might as well be atheists, because they have “stopped trusting God.” It teaches an inflexible theology that presents apostasy as the stark alternative to an acceptance of precisely this interpretation of this passage. As I’ve indicated above, I think it’s deeply and importantly misguided to believe that Adam was just the head of a clan of hominids and that man came into existence by natural, evolutionary processes from non-human animals. I think it creates all kinds of problems for one’s theology of the fall and sin and for one’s view of the image of God. I’ve put lots of energy into arguing against it. But if someone comes to hold that seriously mistaken view about Adam, he can still be going to heaven. Would I argue with a daughter of mine who was influenced by people who teach that? Sure, of course I would. I’m an argumentative person anyway, and I think this is important. Would I be concerned about possible other sociological “domino effects,” causing someone to fall into theological and/or moral liberalism? Yes, I would. If you run with a certain crowd that sneers at special creation, you may pick up other things from them. But despite all of that, I would rather that someone I love were wrong about Adam and still believed that Jesus Christ is God the Son who came to this earth to die for our sins and to rise for our justification than that he decided he might as well go whole hog and become an agnostic or an atheist because of an all-or-nothing theological system! All the more so should we take such an attitude concerning the age of the earth all by itself. Some years ago I knew of a man who lost his faith in Christ. His Christian parents were deeply distressed, of course. They were strong young-earth creationists and said that their son (then in his twenties) had begun sneering about “not believing all of that” and then had made it clear that he didn’t believe Christianity at all, that he no longer regarded himself as a Christian. They were asked this question: Would you rather that your son believed in an old earth and were still a Christian, still a follower of Jesus Christ, still believed in God the Father, Son, and Holy Ghost and in Jesus’ death and resurrection for sin? They said yes, of course! But by then it was too late. Their son never gave anyone a chance to present that alternative to him, to show him the direct, powerful evidence for the resurrection of Jesus Christ and the other truths of Christianity, quite independent of one’s views on the interpretation of Genesis 1. He was an adult by then, and a highly intelligent adult. He was responsible, because he could have figured out for himself that it didn’t all have to stand or fall together. He could have asked more questions, sought for more light, looked into the evidences of Christianity. He chose to apostasize instead. I would not for the world heap blame upon the heads of his heart-broken parents. But let’s get this issue clearer–in our own minds, in our churches, and in our families. If you, dear parents, think that Ken Ham is right about the saying at the top of this post, and all that it implies, I most earnestly urge you, in Christ, to reconsider. All human relationships are rooted in and grow in good ways on trust. Consider this: the one basic lesson that God teaches us is that he can be trusted. Therefore, we should entrust ourselves to him. The lie that Satan tempted Eve with was that God could not be trusted. Trust is rooted in truth and our experiencing over time a person’s faithfulness to truth. When someone demonstrates faithfulness to truth, we regard them as a person of integrity, or a person with integrity, who can be trusted. The term integrity is related to our terms integraland integrated. The terms communicate something about the relational bond or connection that two or more realities have to each other. Of the many ways we can discern that someone is a person of integrity is our detecting that their actions are consistent with their verbal affirmations. If they say they are going to do a particular thing, they do it. If they say they are not going to do a particular thing, they do not do it. If they fail in some way to keep their word, if they are a person of integrity, they admit this failure and they pledge themselves to do better. Of course, according to Scripture, all people are sinners, and therefore in various ways and to varying degrees cannot be trusted; we all fail in some ways to have integrity. But Scripture also teaches that all people are created in God’s image, live in the one creation God has made, and that the whole creation reveals God. This means, among other things, that no person can live without, to some degree, admitting and submitting to God’s truth. God’s truth surrounds us and possesses us. That is, because we are God’s creatures created in his image, our very being reveals God’s truth. As the apostle Paul stated, “In him [God] we live and move and have our being” (Acts 17:28). No person can escape God’s truth, but they can deny and rebel against it. When we do, we do not merely go against God, but ourselves. To sin against God is to go against the truth and to begin to disintegrate; the wages of sin is death (Rom. 6:23). The gospel message of Scripture is that Jesus is The Truth, and by trusting him we are forgiven of our sin and progressively changed by his Spirit of Truth so that we resemble him in our speaking, loving and practicing truth. Do a word search with the word truth using any reputable Bible research tool and read the texts that come up. You will quickly find that Christianity is regarded by the Scriptures of the Old and New Testament as being the way of truth that has the word of truth, the gospel (consider this short list: John 14:6; 17:17; Eph. 1:13; 4:21; Col. 1:5; 2Thess. 2:10-13; Titus 1:1; James 1:18; 3:14; 5:19; 1Peter 1:22; 2Peter 2:2; 1John 1:6-8; 2 John 1:2). Truth equals life. Eternal life is knowing God, who is Truth (John 17:3). The free gift of God is eternal life in Christ Jesus our Lord, who is Truth (Rom. 6:23). When God saves sinners he reveals to them by his Spirit of Truth that he is trustworthy, that he isTruth. Among other things, this means that when God saves us he does a work that is internal to us or within us that has a corresponding work outside of us. This could get a little complicated but it really need not. In short, God’s Spirit affects our thinking and desires so that we come to understand enough of the truth so that we love and obey it (Gal. 5:7; 1Pet. 1:22). Put another way, God’s Spirit causes true Christians to reason rightly about things that are both internal and external to them to the degree that they entrust themselves to God’s Word. Being saved from sin can be described, then as having “right reason.” This is one of the ways that the 19th century Old Princeton theologians described salvation. “Right reason” for the Old Princeton theologians did not mean perfect or flawless reasoning. Still less, did it mean morally neutral reasoning. That does not exist among humans, and the Old Princetonians did not teach or believe that it did. Instead, “right reason” for them meant “corrected” reasoning; reasoning that had been corrected or “righted” and would continue getting corrected (what Scripture calls “sanctification,” see John 17:17) so that the person would increasingly love and obey the truth. Of course, all of what I have written is greatly mocked in many quarters throughout Western culture today, and even called into question by many who call themselves Christians. For well over a century, and to a lightening degree over the past 25 years, the term truth and the practicing of truth has been regarded as only about how the individual feels and thinks about what they are experiencing. The knowing subject, or the person is regarded as the sole authority for truth claims and truthful conduct. Truth is thought to be only subjective,person relative, or based on what someone likes.Many have a Facebook view of truth. In other words, there has been an assault on the biblical concept of truth. Sadly, this view of truth has been embraced by many people confessing to be Christians, many even pastors. Among the many results has been a lack of integrity among them, and within the congregations they pastor. Of course, all Christians are still sinners, who will in this lifetime have constant need to confess sin, repent of it, seek forgiveness, and strive to live more faithful to The Truth, that is, to Jesus, not simply one’s self. We are currently awash in the United States with media outlets that routinely lie, and politicians who are skilled liars. But in a culture that substitutes human feelings and sincerity for truth, a lie gets redefined, and a sustained interest in holding people accountable for anything outside their own sincerity is seriously diminished. No wonder there is great distrust and cynicism that marks much of public life in America. Individual Christians and the Church corporately are to be different, and truly, those who are of The Truth will stand out as different in a culture of lies where many have shown themselves to be untrustworthy. Many of the sharpest and most influential thinkers in England during the first years of the 20th century were outspoken in their skepticism toward the central claims of Christianity. Men such as Robert Blatchford (1851-1943) leveled a number of forceful arguments against Christian doctrine, relying on historical, scientific, and sociological research to bolster their perspectives. Into this arena of prominent, published writers and thinkers marched 29-year-old G. K. Chesterton. Now, it is hard to think of Chesterton as if he were the faithful “David” going forward to battle the skeptical “Goliath,” primarily because Chesterton physically resembled a jolly giant, not a tiny shepherd boy. Nevertheless, when you consider that Chesterton’s age was nearly half that of his opponents, you might be amazed at the skill with which he answered the most common objections to Christianity in his day. In an essay entitled, “Christianity and Rationalism,” Chesterton went public with his Christian faith, and he did so by using the skeptical arguments of Blatchford as the very reasons he subscribed to Christianity. 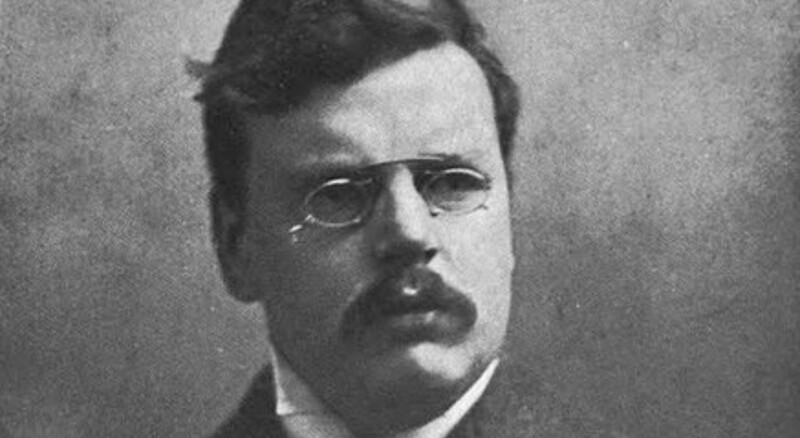 Watch how Chesterton flipped four common arguments against Christianity upside down. Argument #1: There are many ancient mythological accounts that parallel the Christian story. Chesterton’s Response: If a story appears repeatedly in various cultures, might it point to something real? In J. R. R. Tolkien’s famous stroll with a still skeptical C. S. Lewis, Tolkien made the case that Christianity was the myth that really happened. It was the true myth to which all the other stories were pointing. Tolkien’s logic helped Lewis come to faith. But that line of logic wasn’t new with Tolkien. He was echoing Chesterton’s perspective from two decades before. Argument #2: Christianity is a gloomy and ascetic religion that causes people to give up their home and happiness and sacrifice their health or sexuality. Chesterton’s response: If countless people abandon normalcy to pursue the magnificent, might it be that such a reality, in fact, exists? Rather than seeing Christianity’s call to self-denial as a reason to dismiss it, Chesterton saw the devotion of ascetic Christians as evidence for the truly supernatural experience of conversion. “Mr. Blatchford tries to prove that there is no such thing by proving that there are people who live on nothing else,” Chesterton wrote. In other words, the critics were trying to prove that there is no real spiritual experience at the heart of Christianity by pointing to people who seemed to survive on nothing else but their spiritual experience. That’s why Chesterton saw the impulse toward self-denial as a reason to take their truth claims seriously. Argument #3. Christianity has produced tumult and cruelty in the world. Chesterton’s response: If the vision of eternal life “upsets values and creates a kind of cruel rush,” might it be that the vision indicates a real truth? Note that Chesterton was not excusing the cruelty or tumult, only demonstrating why common people may act in these surprising ways. He points to the excesses of the French Revolution in pursuit of “liberty, equality, and fraternity” as a demonstration of the preciousness of those values. “What if Christianity was yet more maddening because it was yet more precious?” he asked, contrasting the “colossal realism” of Christianity to the “eternal sentimentality” of secularism. Argument #4: The Hebrew and Christian accounts of God are tribal, unsophisticated and much too attached to particular locations. Chesterton’s Response: If the Old Testament accounts of God are down-to-earth and unsophisticated, might that very fact indicate their validity? Chesterton made the case that the Old Testament accounts of God’s revelation were credible precisely because they did not come to us as “cosmic philosophy.” The skeptics should turn their skepticism toward anachronistic notions of God being a cosmic force or energy. But, the use of this terminology by Ehrman is a bit misleading. Sure, these people claimed the name of Jesus. That is not in doubt. But, it strains credulity to think that this is a title that accurately and fairly describes their theology. The fact of the matter is that Christians did not believe in 2 or 30 or 365 gods. Christians were committed not only to the Old Testament but to a monotheistic system. The historical evidence for this is overwhelming. The groups that believed in, say, 365 gods were in fact, Gnostics. In particular, Ehrman is referring to Basilides here (and they weren’t really “gods” in the way we think of it, but more like creator-angels). And the theology of the Gnostics was so out of bounds that it could not be recognizably given the label “Christianity” with any historical or theological credibility. But, it is not difficult to see why scholars insist on using labels like “Christianity” to describe such groups. The answer is because it creates the impression that there was greater diversity than there really was. The more the label “Christianity” can be tossed around indiscriminately, then the more it appears that Christians could believe just about anything (and did). In strips the word of all its meaning. What you have in Ehrman’s statement above, then, is a bit of semantic slight of hand. Yes, it is defensible under the heading that “these people thought they were Christians and who am I to say otherwise?” But, at the same time, it remains substantially misleading and, in the end, unhelpful. To take a modern example, consider the UFO religious group “Heaven’s Gate” led by Marshall Applewhite. This group believed that they would, upon death, be transported to an alien ship following the Hale-Bopp comet—a belief that led 39 of them to commit mass suicide in 1997. They also claimed to follow Jesus and to be fulfilling the prophecies of Revelation. When challenged about such a statement, the reporter could say, “Well, this group claims to be Christian!” But, I think we all know that defense is inadequate. No one with journalist integrity would speak in such a misleading way when they know that, historically speaking, this does not represent the Christian faith. Author squeaky2Posted on January 18, 2016 Categories postLeave a comment on Many Christianities? Here is a succinct summation by Louis Berkhof defending the dual aspects of Jesus. Though not texts transmitted for public or private use in a universal scope, these personal articles witness to the general fidelity of the canonical record and so are valuable. You probably don’t need to hear reasons that it’s important to read the Bible. You know it is. Sometimes I listen while doing other tasks such as driving or cleaning or running, but I’ve found it to be incredibly profitable to listen while following along in a different English translation (or in the original languages). Listening to a different version than you are reading helps keep you engaged as you inquisitively consider various renderings. The pace is so fast that you miss all sorts of nuances, but you gain a valuable macro-perspective. Audio-Bibles work well for the Bible’s many styles of literature, though they work best for stories as opposed to proverbs or letters. This is evident when listening to dramatized audio-Bibles (such as my family’s favorite: The Bible Experience). But it’s worth remembering that the congregations whom Paul addressed in his letters typically listened to Paul’s letters and did not own personal copies of them. Tip #2. Read books of the Bible in one sitting. There is value in Bible-reading plans that divvy up the readings so that you read one chapter from four different books of the Bible. But if that’s the only way you read the Bible, it will be difficult to understand key literary features and the theological message of whole books of the Bible. Have you ever read the Gospel according the Matthew straight through in one sitting? Or Romans? Or Job? Or Revelation? If not, you’re missing out. That’s the way they’re meant to be read. A book like Nehemiah would generally take about one hour. Ephesians would take 20 minutes. Here’s afull list of the approximate times it would take to read each book in our English Bible. I understand the objection: “There’s no way I could possibly find time to do this.” But aren’t there other activities you do in life for prolonged periods of time? Do you read other books for a few hours at a time? Do you ever spend an hour watching a TV show or two hours watching a movie or three hours watching a football game? Why not prioritize lengthy, undistracted time in the life-giving word? Tip #3. Read without any chapter or verse references. I am not a fan of chapter and verse references in the Bible. Bible “verses” didn’t even exist until about 1550, and “chapters” go back only to the 1200s. They can obscure the text and create artificial and sometimes inaccurate divisions. Yes, chapter and verse references help us locate specific sentences and phrases quickly. But sometimes they do more harm than good. They lead many people to think of the Bible as a reference book that collects bullet-pointed verse-nuggets — not as the literature that it really is. Get a Bible without them. For example, Biblica has one called The Books of the Bible, and Crossway is planning to release the ESV Reader’s Bible in May. Use a Bible software program like Logos to export a book or passage of Scripture to your favorite word processor without the chapter or verse numbers. Manually delete the chapter and verse references in a word document on your computer. This is time-consuming, but you could copy-and-paste text from a site like Bible Gateway and then delete all the numbering. That’s more feasible for shorter books. Even better, Bible Gateway has an option to hide verse numbers (click on “Page Options”). Take up and read (and listen) a lot.